The average size of container vessels calling U.S. ports has grown considerably over the past five years, and the trend towards even larger vessels is expected to continue in the years to come. According to Drewery Maritime Consultants (Solomon 2014), an estimated 42 percent of current ship orders are for vessels exceeding 12,000 TEU. 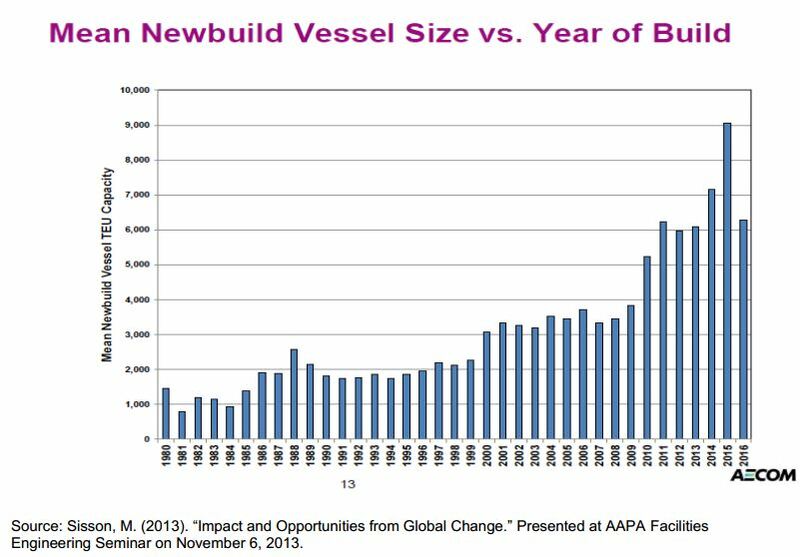 A review of the average size of vessels since 1980 shows a steady upward trend up until 2010, when the growth in average vessel size outpaced the historical growth in vessel capacity. This sharp increase was driven primarily by the arrival of the 10,000 TEU vessels. 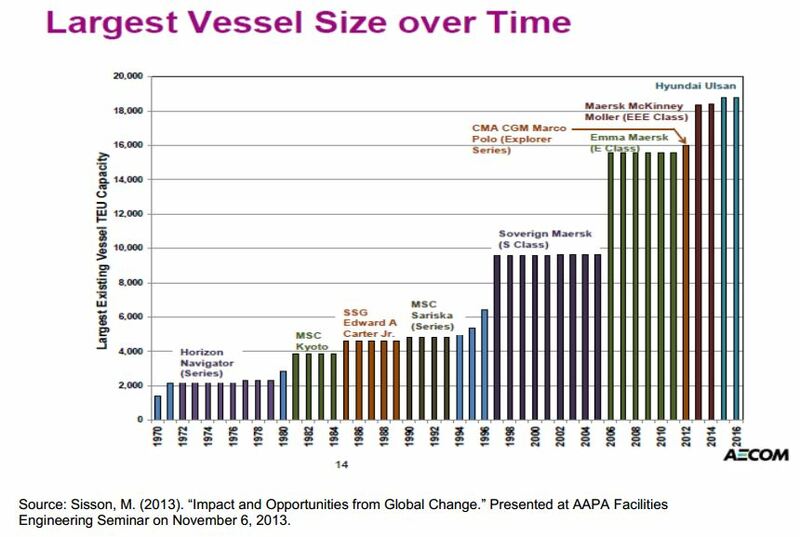 A look at the largest vessel type by year reveals a sharper increase in vessel capacity. 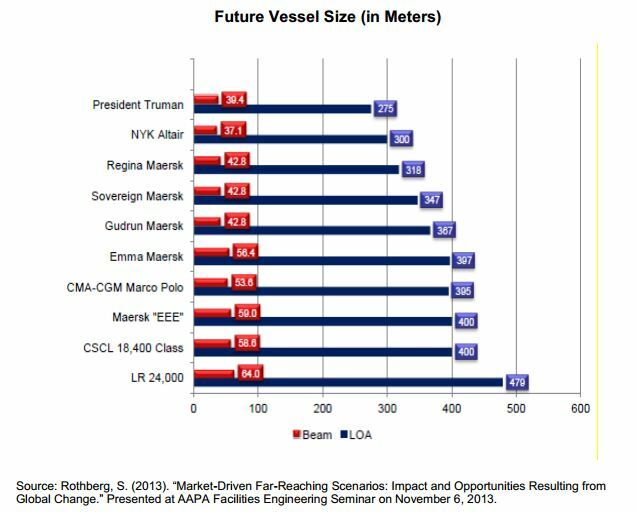 This analysis tracks the largest vessel type from each year instead of the average size. From 1970 to 2014, the largest vessel type grew from 1,800 TEU to over 18,000 TEU. This represents a growth in vessel capacity of 900% during this period. An 18,000 TEU vessel is three times the capacity of the biggest ships only two decades ago. 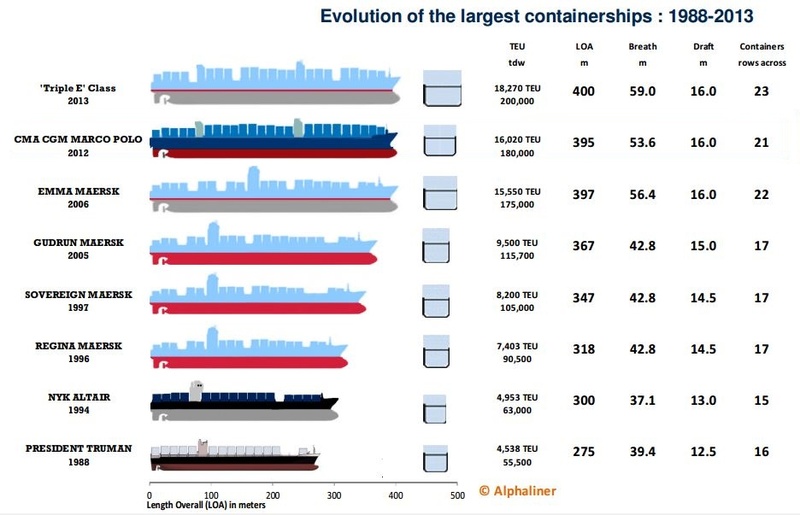 As the aforementioned charts show, the trend towards even larger vessels is expected to continue in the years to come. In fact, Rothberg (2013) reports that delivery of the 22,000 and 24,000 TEU ships currently on order may be delivered sooner than expected. Industry observers predict that 22,000 TEU ships could come in to service by 2018. And, LR already has a design in place for a 24,415 TEU vessel. Although 18,000 TEU vessels are the largest in service currently, ships that carry more than 10,000 TEUs are still considered large and have limited options with regard to trade lanes and to ports that can accommodate them. These vessels, for example, are too large to transit the existing, pre-expansion Panama Canal. In 2000, 15 percent of the world’s container capacity moved on post-Panamax (vessels too large to transit the Panama Canal) vessels. That number increased to 44 percent by 2011. The largest container ships serving North America were in the 10,000 TEU range up until 2012 when vessels carrying 12,500 TEUs began calling at the San Pedro Bay ports. That year, the MSC Beatrice arrived at the Port of Long Beach. With a capacity of 13,800. TEUs (1200 feet long, 167 feet wide), it became the largest vessel to call at a North American port. From a port authority’s perspective, it is important to understand the economic forces driving carriers to expand the capacity of their vessels. According to Brooks (2014), the global recession and a gradual recovery in cargo demand have contributed to billions of dollars in collective losses among carriers in four of the past five years. In the wake of the economic downturn, ocean carriers have responded to competitive pressures by reducing operational costs. Running larger, more efficient ships on major trade lanes is one way they have achieved that. Larger vessels allow for economies of scale, reducing the cost of shipping each container. In addition, new ship designs allow for more fuel efficient operations. For example, the Triple E class, which stands for energy, efficiency, and environmental improvements, can carry up to 18,000 TEUs. These ships reach up to 1,300 feet long and 200 feet wide. The Triple E’s also have a top speed that is less than earlier generations of ships, reinforcing a recent trend in the industry toward slow steaming. With slow steaming, carriers reduce vessel speed in order to burn less fuel, thereby reducing emissions as well as operating costs. Five years ago, the average speed of the largest vessels at that time was in the range of 20-25 knots (Streng 2012). Today, the average speed has dropped to 15-17 knots. But, while slow steaming has cut fuel costs for shipping lines, Streng (2012) also suggests that the cost savings achieved by the larger vessels are not obvious for the entire supply chain. Due to the increase in transportation duration, the capital and insurance costs of the goods transported have gone up. Still, any reduction in fuel usage can lead to significant cost savings as some carriers spend up to $4 billion in fuel each year. A comparison of the cost per day at sea shows how the cost per TEU falls as the size of the vessel increases. As the above table shows, the total cost per day at sea goes up as the vessel size increases. While a 12,500 TEU vessel is expected to incur total costs per day at sea of $155,382, the same cost for a 24,000 TEU vessel is estimated at $229,693. At the same time, the cost per slot falls as the vessel size grows. Using the slot cost in a 12,500 TEU vessel as the baseline, the per TEU cost falls by 11.83 percent in an 18,000 TEU vessel, 19.23 percent in a 22,000 TEU vessel and by 23.01 percent in a 24,000 TEU vessel. The slot cost savings become even more significant when a carrier’s total TEU volume is taken into account. It is my pleasure to share some information with all the community. Previous Entry Bigger Canal + Bigger Ships = Less Pollution?